I confess I have a great soft spot for the half-mad adventurers who build painstaking replicas of ancient seacraft and then trust their fates to them on long ocean voyages. Their published narratives speckle my bookshelves–from Thor Heyerdahl’s account of his balsa-wood-raft voyage from South America to the Tuamotu Islands in Polynesia, to lesser known tomes recounting near-death experiences aboard ox-hide Celtic coracles in the storm-tossed North Atlantic and Viking knarrs navigating iceberg-littered waters off the Newfoundland coast. The courage of these modern mariners is truly impressive. The latest in this band of nautical brothers is the crew now sailing around Africa aboard a replica of a 2500-year-old Phoenician ship. The team, led by former Royal Navy officer Philip Beale, is attempting to recreate what is thought to be the first circumnavigation of Africa by Phoenician sailors around 600 B.C. The great classical Greek historian Herodotus briefly described this epic three-year-long voyage in The Histories. According to Herodotus, the Egyptian pharoah Nekho II commanded a small fleet of Phoenician ships–the master mariners of the day–to explore the African coast from East to West. After rounding the horn of Africa, they sailed southward, stopping only to plant and reap grain for ship’s supplies, then passed through the dreaded Pillars of Heracles. From there, they returned along the coast of western Africa to Egypt. Beale and his companions have built what they believe to be a faithful replica of a Phoenician ship of the era, right down to 8000 olive-wood pins to hold everything together. Two days ago they docked in the South African port of East London, and the crew is now preparing to head off to Capetown. The toughest part of the voyage lies ahead, as they round the tip of Africa. If you’re interested in following their voyage, I’d suggest checking out their info-packed website. It has a wealth of information on Phoenician history and seafaring. I certainly wish them kind winds and a safe journey. Two recent reconstructions have been in the news as well. Don’t know if you’ve seen them? 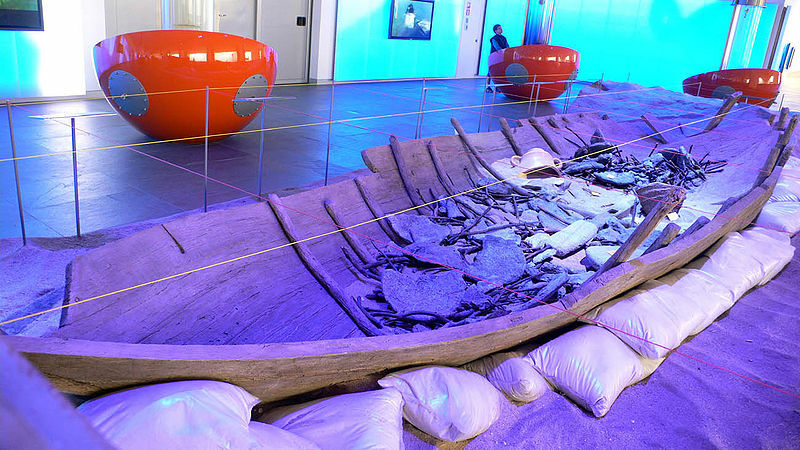 There’s the Jewel of Muscat, a replica of a 9th century Arab ship that used to trade between Oman and the East Indies. And there’s a reconstruction of one of Hatshepsut’s vessels that went to Punt. Thanks so much for this info! I read a few months ago about Cheryl Ward and her team’s reconstruction of an Egyptian seagoing vessel. It’s an immensely cool project of great scientific value. Cheryl is a nautical archaeologist–a very good one–and I’ve interviewed her in the past, and hope to post on her work here in the future. But I hadn’t heard anything about the Jewel of Muscat project. This sounds like a great project, too, and the website is fascinating. I will definitely follow their progress now! Thanks again for drawing this all to our attention!